Whilst many governments make use of simulation, both individually and collaboratively, little is known about it outside professional circles. Yet modelling is often the means by which governments test and refine their military and political policies. Military simulations are seen as a useful way to develop tactical, strategical and doctrinal solutions, but critics argue that the conclusions drawn from such models are inherently flawed, due to the approximate nature of the models used. Such simulations were originally intended to model combat scenarios against an abstract enemy in a specific terrain without the loss to troops and incurring only minimal damage to miltary equipment and resources. Such simulations can give the troops and commanders of a given operation a ‘dry run’ and provide a psychological advantage for everyone involved. Typically most War Games are held under ‘real’ battlefield circumstances – matching the actual environment in which planned or expected attacks are to be carried out as closely as possible. This would permit the strategists to avoid common pitfalls, such as not taking into account environmental conditions specific to the relevant location and other aspects that may be easy to overlook in theory. Such simulations are known as ‘Full Scale Field Exercises’. However these are often quite expensive to run and for this reason they are limited to situations where they are required by military intelligence oversight. Since the first soldier picked up a stick in imitation of a real sword, the line between war and entertainment has been decidedly blurry. Military training in ancient Greece and Europe in the Middle Ages gave rise to the Olympics and medieval jousting tournaments respectively; paintball guns and video games have become tools for honing the skills of today’s soldiers. The realm of strategy, however, is where games have exerted the most remarkable impact on the conduct of war, serving as a tool for, as one U.S. Army general put it, "writing history in advance." The following is excerpted from a paper called "An Introduction to War Games" by M.G. Weiner and made available by the Rand Corporation – click here for source. 1. War games orginated as devices for planning military operations. Thsi viewpoint assumes that some military commander, perhaps an Oriental general, planned his operations by reprresenting his own forces and those of the enemy on a map or by scribbles in the sand, and tried to work out various moves or actions that might be taken by each side. He was, in a sense, constructing a mdoel in which he could examine the major moves that he could make and those that the enemy could make in order to find the most effective course of action. He may even have applied rules which his experience had taught him were characteristic of military operations. Perhaps he even found it advantageous to introduce another person to ‘play’ the enemy so that he would have the benefit of another point of view or not overlook something important to the battle outcome. Whatever form it took, this early development is regarded as an attempt to symbolize in an expllicit manner the interplay of two opposing military forces. 2. War games originated as instructional devices. According to this viewpoint early games were developed and used to instruct ooorly trained and illiterate troops in the actions that they were to take in the forthcoming battle. The military commander sketched the position of the enemy and his own position and indicated ot the troops various moves that might be made by both sides. He then demonstrated in this graphic manner the actions that his troops were to carry out under each contingency that might arise. In both this and the preeceding speculation on the origins of war games the emphasis was n the ‘war’ aspect, i.e., the gaming was adapted to the game situations. 3. War games originated as symbolic equivalents. There are several varieties of this point of view. They include the spculation that the games were used as ‘moral equivalents’ for war during periods of leisure. In particular, it has been proposed that early forms of chess provided safety valves for the beligerent Hindus. Another version assumes that the games have a mystical or religious significance. They were used by the players as a method of understanding the workings of fate, since the outcomes of the games were presumed to be determined by the forces of destiny. Players who mastered a game were regarded as having achieved some control over fate and were held in esteem. 5. War games originated as a form of orgnaized play. This speculation is similar to the preceding one in assuming a non-military origin and in emphasis on the use of leisure time. The difference is that the games were social in nature and occupied much the same position in earlier societies that parlor games do in our present society, i.e., they are socially acceptable forms of competition. 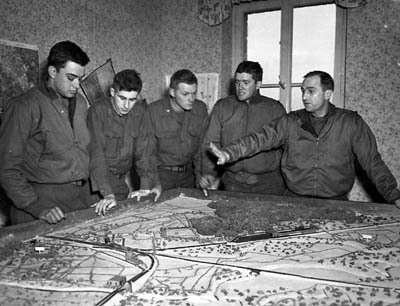 The ‘Map Exercise’ is a minor form of War Game conducted by senior planner/strategists where terrain and troop movement aspects need to be considered independently. These are very close to ‘Sand Table Exercises’. Both types of exercise are now being migrated to digital platforms as use of the computer becomes more pervasive. Increasingly, such simulations exist in the digital realm. This is especially true as computer assistance and visualization/targeting takes a more and more important role in real warfare. In the case of attack by drones (by proxy) – there is no human component on the battlefield and a battle simulation is indistinguishable from an actual operation. The 1983 movie ‘War Games’ imagines such a scenario and the ensuing catastrophe, with a network of ICBMs aimed at the USSR mistakenly triggered by a high school student over a computer network. I am not sure if the author of the script realized just how prescient such a plot would be 30 or 40 years later, as the lines between gaming / simulation and actual warfare become more blurred. An example of such an exercise, traditionally known in pre-digital parlance, as a ‘sand table exercise’ (since most such models were generally acted out with model troops and vehicles on a ‘sand table’) is known as ‘DARWARS’ – a set of digital simulations and exercises developed under the guidance of DARPA and the DoD (Department of Defense). VIDEO: A simple version of a war game to show the effect of a microwave device designed to ‘cook’ protestors at a public demonstration by the US Army – like a remotely operated electronic cattle prod. Such field simulations are invaluable to understand the subtleties of human response to a situation, even though they participants are volunteers. In order to be able to run a simulation as effectively as possible, whenever possible, a war game should mimic reality as closely as possible. Elements of chance which may be overlooked by overly simplistic computerized models can then be avoided. Hence many ‘war games’ are played out on real battlefields under anticipated battle conditions. In commercial media also – poltiical strategies can be effectively acted upon. By presenting false or erroneous ‘stories in the media, by presenting the appropriate ‘stimulus’, any desired public response may be effected. A news story can be run the night before an election or vote for/against an issue – once the polling is closed and the ‘story’ revealed to be erroneous, political goals can be accomplished without actually involving poltiicians in misleading the public directly. Of course, this involves the complicity of the media source. But where such commercial operations are concerned, and the results of winning public opinion of such large scale consequence – the purchase of media influence is both commonplace and beneficial for both parties – see also the following link on media influence. An Introduction to War Games, M.G. Weiner, Rand Corporation, 1959. Military Planning in an Uncertain World, Herman Kahn, Irwin Mann, Rand Corporation, 1957.